Plaque is a constant threat to your dental health, particularly if it is allowed to develop into tartar. Plaque is a coating of the bacteria in your mouth that subsists on food particles there. Plaque creates an acid that is corrosive to your teeth. Unremoved plaque hardens into tartar (also called calculus). This is a yellow-brown hard substance that makes teeth look unattractive and also goes far beyond that. Hard tartar pokes at your gumline causing irritation, inflammation, and eventually gum disease. So how do you prevent tartar? And what can be done if it collects on your teeth? Cardiff Dental has answers for you! Plaque is a clear, sticky film that attaches to the tooth surface. Plaque accumulates after you eat foods that contain a lot of carbohydrates, such as sweets and candy, starchy snacks, and sodas. Bacteria that live in plaque eat these sugary and starchy foods and excrete acids in return. Cavities – The bacteria contained in plaque produce acid. This acid, when it stays in contact with the enamel for an extended period of time, softens and weakens it. Eventually, the acid breaks through the enamel, allowing bacteria to enter the tooth and cause a cavity. Periodontal disease – As plaque hardens into tartar, it becomes an irritant to gum tissues, causing inflammation. The gums and jawbone respond to this inflammation and the tartar by backing away from it. This breaks the healthy attachment of the gums and jawbone to teeth, which can result in tooth loss. Bad breath – Plaque buildup is the number one cause of bad breath. Plaque can be removed by brushing your teeth twice a day and flossing daily. Regular dental cleanings are also a great defense against plaque buildup. You might also consider ways to reduce the amount of plaque that forms on your teeth. One way to do so is to reduce sugar intake. Cut back on candy, baked goods, and starchy snacks. One key hint is to cut back on consumption of sugary drinks such as colas, energy drinks, and juices. If you fail to remove plaque it hardens into a coating known as tartar or dental calculus. Tartar buildup, which is stickier than tooth enamel, then creates a more hospitable environment for plaque to take hold. Tartar stains easily and is visible on the teeth. 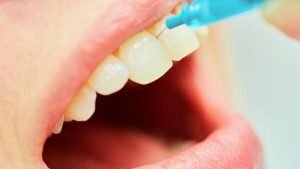 How does tartar damage teeth and gums? Tartar makes it more difficult to brush and floss as you should. This can lead to cavities and tooth decay. Tartar forming above gum line can irritate and damage your gums. Over time, this can lead to progressive gum disease. The mildest form of gum disease is gingivitis, which can usually be stopped and reversed if you brush, floss, use an antiseptic mouthwash, and get regular dental cleanings. If not, it can get worse, eventually forming pockets between the gums and teeth and leading to infection by bacteria, or periodontitis. Periodontitis can damage the bones and tissues holding your teeth in place. Some studies link the bacteria/inflammation of gum disease to heart disease and other general health problems. While plaque is removed by simple brushing and flossing, only a dentist or hygienist can remove tartar from the tooth’s surface. The first step is a scaling, or deep teeth cleaning. The dental hygienist or dentist uses specialized instruments to gently remove tartar without hurting your teeth. Ultrasonic instruments. An ultrasonic instrument uses sound vibrations to break larger pieces of tartar loose, while spraying a mist of water to wash debris away. Fine hand tools. Once the larger chunks of tartar are removed, the dental worker switches to finer tools (called scalers and curettes) to remove smaller deposits and smoothen the tooth surfaces. Polishing. Once tooth surfaces are smooth, the dental worker may polish your teeth using a slow speed tool covered in a special gritty toothpaste-like material. Fluoride. Your dentist may also apply fluoride. Prevention. Prevention is most important in dealing with tartar buildup. Tartar can form quickly, even overnight, so it’s important not to skip even a single tooth brushing. 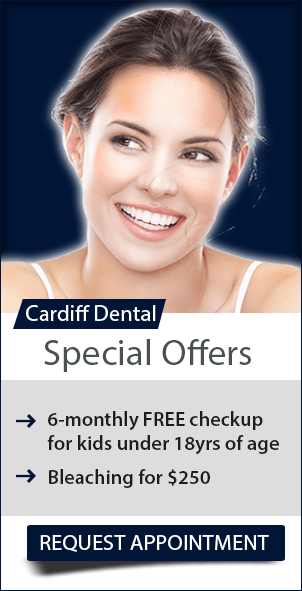 See your Cardiff Dental dentist! We offer comprehensive cosmetic, implant, and family dentistry, taking great pride in treating our patients and keeping their smiles healthy and beautiful. We use the finest materials and delivering an exquisite result, all the while forming lasting relationships with our patients. A local family owned and family run dental practice. At Cardiff Dental, our goal is to make quality dental care affordable. We encourage you to take advantage of our latest offers. To find out more, visit our promotions page today! Call us on (02) 4954 6888 or book your appointment online.